Hi Simon. Please tell us a bit about your musical background, different solo aliases and the musical styles you produce under them. Simon: I went to piano school at a really early age, but grew tired quickly of playing other peoples works so I started making my own gradually. Everything changed when I discovered my first Tracker program on my older brothers Amiga and hooked up my $1 microphone to it. 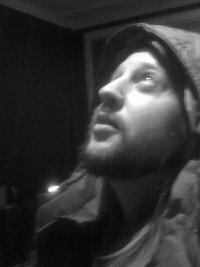 The music I made was all about atmosphere and a few years later I found out that the genre was called "Black Ambient". Now at that age I was, around 10-12, I never stopped experimenting in my free time and when the big metal era came I started playing bass guitar in a band. Frustration kind of grew since my band wanted to play cover songs. I spent my free time writing my own material and spent all my money on buying studio equipment. Cubasis saved me. I started recording everything from bass, electric guitar and layering electronic drums and sounds on top of it. It sounded very Rammstein. Fast forward, a lot of mushrooms later and the new millennium is here. I am making Goa/Psy and funk-chillout playing at raves all over Scandinavia with the Knaprika project I started with Donald Persson. I am working with Simon Kölle and Donald Persson with Za Frûmi, the medieval/fantasy project which got a fantastic receiving because of our odd take on what abstract music could be, blending bombastic compositions with classical instrumentation and field recording all over Europe with film type microphones and portable DAT-recorders and not least a storyline spanning 3 albums with dialogue in Black Tongue (the Tolkien language of Orcs). This resulted in a 10 page article in Wired Magazine (which seemed huge to us at that time) and later got us featured on Swedish television's annual celebration of classical music, with the famous Swedish Radio Orchestra performing our work. More importantly these times showed me how much fun making music could be, traveling all over with friends discussing sounds, vibrations and techniques and creating a world beyond our own. It was all very non Rock'n'Roll, just laidback, friendly and philosophical. In my free time during all this I worked on the solo dark ambient project Atrium Carceri, which got me right back at where I started. This time creating far more complex landscapes of abstract noise and using my knowledge of field recording to great effect making Atrium Carceri what it is today, one of the leading acts in the genre with 6 albums released. 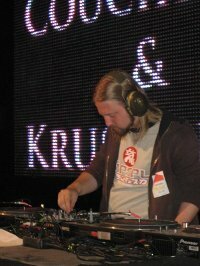 Za Frûmi was worked on during this 10 year period as well spanning 8 albums and sometime during all of this, Knaprika was slowly put on hold and in its vacuum Krusseldorf was born. Atrium Carceri - Black Ambient project, spanning 6 albums so far and one of the most known names in the genre. Alvskugga - Medieval music with a few early releases. Abnocto - Simon Kölle and my project, highly spiritual and renaissance-styled music spanning an album and a few compilation works. Dorf Unit - Jazzy acoustic vibes with me and Unity. Sojobo - Mine and Jonas Svennhards glitchy-dreamy chillout. 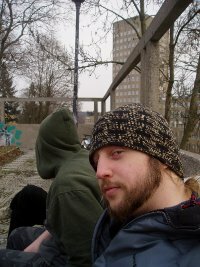 Knaprika - Mine and Donald Perssons psytrance and psychill project which had a good era during the end of the millennia playing a lot of raves and parties all over northern Europe. Za Frûmi - Mine, Donald Perssons (until he left the project after 2 albums) and Simon Kölles classical-fantasy-theatrical project which follows a group of Orcs and their epic storyline with full dialogue (Tolkien's Black Tongue speech) spanning 3 albums and then 5 instrumental albums which fills in a lot of places in the world we created, history, cult, orders and atmospherics. Paprika - The pre-knaprika project which had a more funky vibe with a focus on 70s cop movies, paper-coffee cups and afros. Preponderance - My dubstep project which spanned 40 tracks or so, currently on hold but I am sure I will get back to it eventually. Couchlock - My Project with Michael Koraschewski/Cyn, a few releases here and there. Loungy housey vibes in a downtempo environment. SOC - A 4/4 experimental project which is in its early stages. ERP - A production studio for television and media which me, Jari Ronkko/Zekazy/Kinkie and Eki Jokkasalo/Sienis/Kinkie run by the side of our other projects. 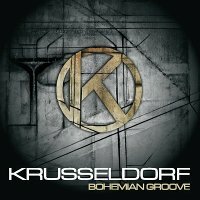 Your second album under the Krusseldorf alias - Bohemian Groove - is dreamy, quirky and accessible, while the first one was a bit darker and sounded a bit more experimental at times. Is your second album simply an outcome of a natural growth process as an artist? Or maybe something else caused you to change the atmosphere? Simon: I cleaned up the mix a lot on the second album as I have learned a great deal being in the studio every day working on all my different projects. I think the second one is just as experimental, but has a more natural flow to it, due to me going back and forth eliminating everything that disturbs the flow, which means it will of course be more accessible as you won't notice any abnormalities either in mix or... you guessed it, the flow. I never strive to release the same album twice, which always in all my different projects split my fans up between a group that have a love for nostalgia (and love my earlier albums) and a group that is always peering into the future. The nostalgia group is getting smaller and the time travelers are getting larger as people know by now that I am always not just evolving but changing and morphing my sound in every new release. What does the Bohemian Groove album means to you? Tell us a bit about the musical fusions in this album. Simon: From a conceptual standpoint it is an anti NWO-album, the name tells as much doesn't it? And the few samples I do have is quite open about it too. But from a musical standpoint it is all about creating new genres or making crossover ones. For example the IDM genre is something I do enjoy parts of (the glitchiness, the brown noise, tight percs), but it is often very monotonous and boring from a compositional standpoint, so towards the middle of the album I have some IDM-stuff but it isn't monotonous or flat from a compositional standpoint. Krusseldorf is all about music I would like to listen to myself, and maybe I am different from other producers like that, but I actually listen to my own music a LOT. Mainly because when I am in a period where I want to listen to something specific (say lounge or bossanova for example), I try to find something to my liking, and if I don't find anything. I sit down and produce it myself, most often I find lounge to be lacking depth and details in the mix, so when I do lounge I fuse it with other genres that can make it more crisp and interesting, but more importantly I make music without the rules of the genre I am producing, this makes a very natural fusion of either existing genres or non-existing ones. I create a load of genres of music, some of which I am not releasing, which are just for personal use and some which just are too weird for the labels I am on. Do you have a favorite piece of equipment that you use in the studio? Simon: My microphones are my dearest friends. The Röde NT1 has been with me for along time now and it is still rocking for that hollow acoustic sound. A lot of excellent music comes out of Sweden, mainly in the electronic turf, the progressive rock turf, the metal turf and also in the jazz turf. So what is going on over there? Is it something in the air? Simon: We have many months of darkness here and I think that has a lot to do with it. I rarely see the sun myself even during the months we do have sun. I wake up when the sun goes down and go to sleep when the sun goes up almost always. I find myself to be a lot more inspired during the night and have been as long as I can remember. Last I checked I did not have fang marks on my neck though, so maybe it is something in the air... or something “they” put in the water? Tell us about an album that had a big influence on your life? Simon: Vangelis- 1492, Hans Zimmers- Gladiator, Ott- Hallucinogen in Dub. I will talk about Hallucinogen in Dub. I think this album showed me a new quality to details and the mix. It kind of showed me that the downtempo genre was getting a mix and sound quality that rivaled all genres of music whereas earlier we had a more rough mix. It was so good this album, that I kind of stopped doing dub completely, because there was a new champion in the world of psydub and his name was Ott. I know a lot of people jumped on the bandwagon to create psydub-only albums, but for me... if I want to listen to psydub, I put on Ott because let's face it, he is the mastermind of this genre. What's on your CD player at the moment? Simon: One of my own tracks I am listening to again and again to try and find any faults before it is released. It is a collaboration with Michael Banel/Behind Blue Eyes. Can we expect another solo release from you soon? Or maybe a collaboration album? Simon: I have an upcoming Krusseldorf album on Aleph Zero and a collaboration album with Behind Blue Eyes at Iboga records coming up, hopefully before the end of the year. There's also a digital remixes EP to the 5 Pointed Star tracks coming up on Beats & Pieces soon with remixes by Tor.ma in Dub, Agalactia and (val)Liam and a bonus Krusseldorf track. Tell us a bit about your relationship with the different labels you work with, Beats & Pieces, Iboga and Aleph Zero. Simon: I have a good relationship with all labels, a bit more personal relationship with Iboga since I work with Behind Blue Eyes there. Beats & Pieces is looking good so far and Aleph Zero is a little slow, they seem to have a lot on their plate. Where and when can we catch you play live this summer? Simon: I will be on vacation for the most part of the summer and the rest of the time I will spend in the studio working on the Aleph Zero album, the Behind blue eyes collaboration, my new Atrium Carceri album, my upcoming Za Frûmi album and who knows, maybe even the Abnocto album. Most of my listeners know by now that I am not a big fan of either attending or playing live gigs, because of my belief that music should be experienced with closed eyes so you can see the visuals from within. I am not too fond of "shows" as they detract from the music and on every live gig I have played or attended, the natural reverberation and broken frequencies just destroys the joyful mix and details of the producers. Although a vibrating boombastic bass is fun in its own right. Thanks for your time Simon. If there is anything you would like to add, please do. Simon: Be free brothers and sisters and thank you for listening!